The first game of the week happened on the Thursday, when Palmeiras received Botafogo from Rio de Janeiro. Palmeiras’ line-up consisted of Marcos; Vitor, Edinho, Maurício Ramos and Armero; Pierre, Márcio Araújo, Marcos Assunção and Lincoln; Kleber and Ewerthon. The game marked the inauguration of Palmeiras’ new jersey; in fact, if you watch the match highlights (link at the end), you will notice how players changed shirts in half time (the bright lime green of course being the second jersey) to even further highlight the occasion. After a slow first half, with few shots targeting either goal but Botafogo looking a tad more creative, Palmeiras came back for the second half all fired up. With both Lincoln and Marcos Assunção advancing their positions and playing more offensively, Palmeiras took control of the game. The goals came naturally: a beautiful free kick by Assunção found the left upper corner between the posts and left Botafogo’s keeper hanging in the air. The second was the result of a perfectly timed counter attack evolving Lincoln, Ewerthon and Kleber with the finishing touch, leaving the score at 2-0 after 12 minutes into the second half. Unexplainably, Palmeiras immediately seemed to pull the breaks after the second goal. Botafogo grew considerably and had the best possible outcome out of two opportunities that could have resulted in nothing had it not been for the great fortune by which Jobson and Antônio Carlos for Botafogo put their foreheads to the ball. Thus, at 24 and 34 minutes of the second half, Palmeiras conceded two header goals and that was that. Scolari substituted Lincoln and Ewerthon for Tadeu and Patrik, without much changing the picture. The result could actually have been even worse had it not been for a great save by Marcos in the finishing minutes. 2-2, a draw that felt like a defeat. To make things worse, Marcos Assunção received a red card in the end of the game, while Pierre and Edinho received their third yellow, meaning that neither of them would be available for Sunday’s away game against Ceará. Watch the Palmeiras 2-2 Botafogo highlights below. Kleber made some comments after the game that could be interpreted as critique against his teammates in the defence. Coach Scolari did not take lightly to this and immediately prohibited any player to concede interviews in half time or directly after the game (i.e. while still on the pitch). Further, Big Phil stipulated a fine of up to €4.500 to any player who breaks the rule. Also, in view of the negative result against Botafogo and Palmeiras’ poor position in the league (10th place), Scolari declared that he has basically given up the quest for the title, instead focusing on finishing in the top 4, securing a ticket to next season’s Copa Libertadores. Sunday gave us Palmeiras vs. Ceará in Fortaleza. Ceará has an impressive streak at home grounds and currently holds 3rd position in the Brasileirão. Palmeiras went in heavily crippled: centre back Danilo continues suspended for another nine games after an incident with the player Manoel from Atlético-PR where Danilo fired away a racial slur at the opponent; Marcos Assunção, Pierre and Edinho all suspended for being booked in Thursday’s game; and Marcos, feeling pains in the knee he operated during the World Cup break, was vetoed by the medical department. The scenario above forced coach Felipão to find solutions at the junior level. He choose two midfielders to travel with the group to Fortaleza,18 year old Bruno Turco and 19 year old Gilsinho. He also remodelled team setup and tactics and choose a starting 11 set at a 4-4-2 formation composed of Deola; Vitor, Léo, Maurício Ramos and Pablo Armero; Márcio Araújo, Tinga, Patrick and Lincoln; Kleber and Ewerthon. Ceará initiated the game with a strong blitz and completely dominated Palmeiras during the first 15 minutes. After that, the game gradually became more balanced, with a couple of clear opportunities on both sides. Deola seemed confident between the post, and Tinga had an inspired evening, rapidly conducing the ball and launching attacks to Kleber and Ewerthon, both quite mobile and apparently understanding each other’s ways more and more. Still, we went to half time with 0-0. 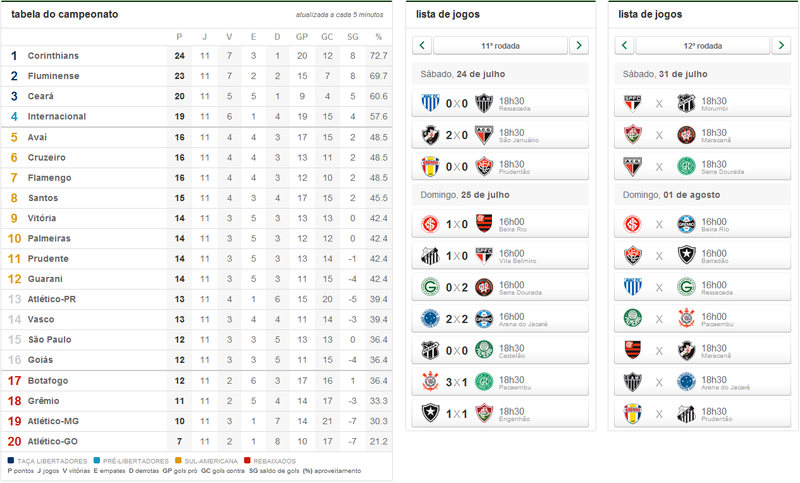 Second half, and Palmeiras, as against Botafogo on Thursday, came back much more alight. Kleber came closest with one shot just wide and another hitting the post. Also Lincoln missed a great opportunity close to the end, probably more because of fatigue than anything else. The game got very intense the last 20 minutes, particularly after Palmeiras’ defender Léo got sent off after a second yellow card. Scolari’s substitutions were basically to strengthen the defensive capabilities and put in fresh players: Leandro Amaro on Ewerthon, Gabriel Silva on Lincoln and Tadeu on Kleber. Ceará had several clear chances, but Deola showed strength and the whole team kept it together quite well considering the circumstances. Also Pablo Armero showed a lot of heart. 0-0 was the end result, this time the draw almost tasting of victory. Palmeiras’ next game is coming Sunday against arch rival Corinthians. Expect a much stronger Palmeiras, with several key players back and hungry. The Botafogo match must have been exciting to watch live. Strange red card at the end. Yes, it was a good match. Not so much the first half, but the second was good fun (although not that much for a palmeirense). The ref sent off one player from each team. A bit harsh, in my view. And particularly bad for Palmeiras, who’s short on midfielders at the moment. Abraços, keep them comments coming, my friend!